This chapbook hatched over supper conversations after a Versefest event in March 2013. 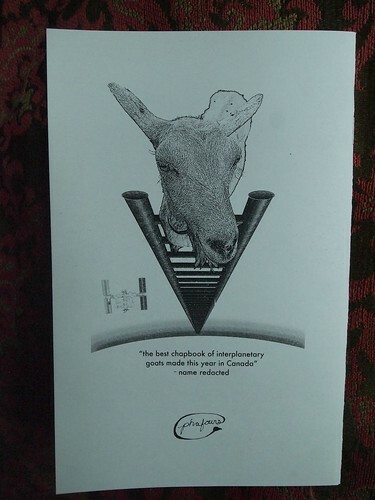 Janice Tokar said something about squirrels wearing Stetsons, and Carol Stephen said something about goats on Mars. It was on. Fast-forward a month and I have a call out. Flyers are going around the spring Ottawa small press fair, thanks to Amanda Earl bringing them in my absence. 6 months after that, poems that jive together in a strange way with curiosity, careful observation of language, each in their own way, and play against the rules. Each takes their own angle at space, squirrels, goats and humanity. Each charm me entirely. 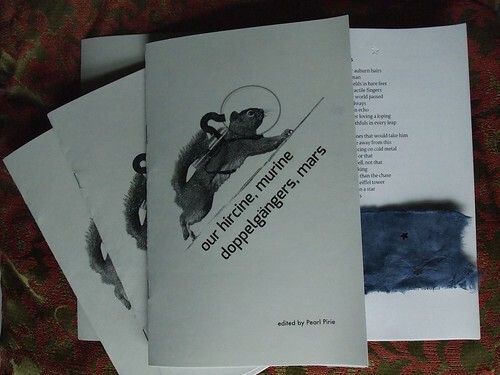 1 month more and we have a fun little chapbook called “our hircine, murine doppelgangers, mars” with poems by Gary Barwin, Vivian Vavassis, Phil Hall, Janet Hepburn, Lori Anderson Moseman, Ryan Pratt, Carol A Stephen and Shai Ben-Shalom. Some contributor copies are in the mail. Once I get the rest collated and bound, I’ll put up at link at the phafours website. They’ll be $5 plus shipping.